C. Julius Solinus wrote the 'Wonders of the World' or 'Collection of Memorable Things', probably in the mid-third century AD. He unblushingly plagiarised material on ancient curiosities from Pliny's 'Natural History' and other works to create a gazetteer of geography, historical events, religion, customs, and natural history. 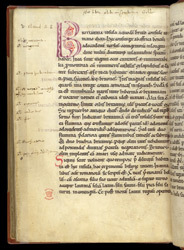 Revised in the 6th century under the title 'Polyhistor,' it became very popular in the Middle Ages, although its title was mistaken as the author's name.